I have been a patient of Yuriy Levit for 8+ years. Prior to obtaining therapy from Yuriy, I suffered for a number of years with lumbar muscle spasm and sciatica. I injured my shoulder at the gym and suffered with rotator cuff injuries in both shoulders. Yuriy's therapy - a combination of massage, acupuncture, cupping and craniosacral therapy relieved my pain and spasm. I am pain free, have movement in both shoulders, my sciatica and muscle spasm have disappeared. I continue to receive therapy for maintenance. Yuriy is professional and honest, and I have no reservation in recommending Yuriy to anyone. I have enjoyed the services of Yuriy for over 6 years. I find him to be well skilled, professional and flexible. I especially appreciate having him come to the home. I have recommended him to family and friends. Yuriy is a reliable, professional and dependable RMT. I think he performs a great deep tissue massage. I feel fantastic afterwards. Thanks to Yuriy! 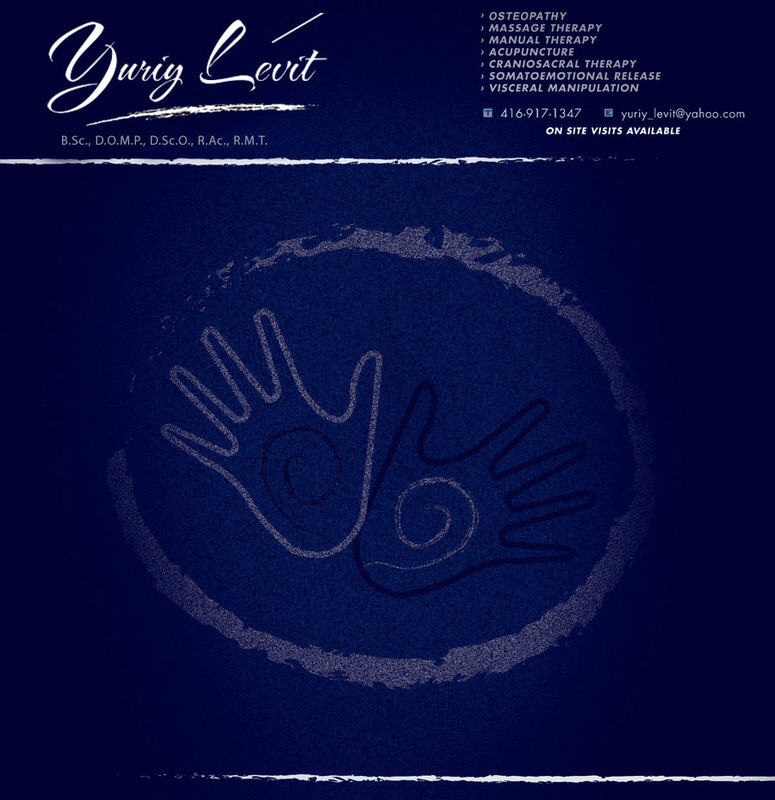 I have been a patient of Yuriy Levit for over 8 years now. My work relates to a lot of driving, and sitting in the car most of the day causes a lot of pain. His unique treatments are invaluable to me. Not even I managed to get rid of back pain, but due to Yuriy's unique experience I am able to stay in grate physical shape, play soccer every Sunday, and maintain very active life style at the age of 50. Yuriy Levit was introduced to us seven years ago. He was recommended by his patient and our friend. Our friend told us that we will not be disappointed to meet him and use his service. We were so impressed with Yuriy and we steel are. We can not wait for him to come to us, few times per week and give us the best massage ever. He is excellent massage therapist, helpful, reliable, gentle, and considered. We wish that we have more people like him. We can recommend him to every one at any time. God bless him. Yuriy has been my massage therapist for over 5 years. He comes directly to you and works from the comfort of your own home, which is not only convenient but provides a comfortable and relaxing atmosphere to get the most from his treatments. Yuriy is highly trained in several areas of massage therapy and manual therapy techniques as well as natural medicine. He spends the time and works with me each session to target problem areas and find solutions that suit my specific needs. Yuriy finds the problem, designs a solution and works it to completion. His service level is unmatched in both dedication and consistent, constructive proactive follow-up. You can't ask for more! When I arrived under Yuriy's care I had carpal tunnel syndrome, tennis elbow, and my back and neck had hurt badly. Yuriy is a "Professional Saint" from my standpoint as his methods have worked where everything else has failed. I have greatest admiration for Yuriy. He is also very personable, very empathetic and most of all, his techniques work. I have no hesitation in recommending anyone with pain to see Yuriy for a consultation or a session. He has worked miracles where doctors' medicine and other methods have failed. I was recommended to Yuriy Levit by a family member. I have old injuries and reoccurring problems with my back and shoulders. Yuriy has a style that is one of a kind. He is thorough. He works well with people. He is very kind, but most of all his techniques work. I would recommend that anyone willing to get result to see Yuriy. You won't be sorry. Yuriy has treated my lower back and joint problem for several years. When it bothered me recently, he successfully treated the problems with both manual therapy and massage. He seems to have an endless variety of techniques that are both successful and relaxing. I will continue to see Yuriy when needed and highly recommend his skill. I have been a Patient of Yuriy for about 10 yrs now. Years of abuse of my body through normal living and many accidents and incidents in life left me with much chronic pain. We first started with deep tissue massage and moved on to other techniques that this modest man has to offer, but does not push. His massage therapy is amazing and when you open yourself to his other techniques such as craniosacral therapy, acupuncture, visceral manipulation and manual therapy, you will see amazing results. I trust him 100% to do whatever is best for my well being and I am never disappointed with this deeply caring man who puts 110% into all of his treatments thinking only of you and the end result - to be pain free!